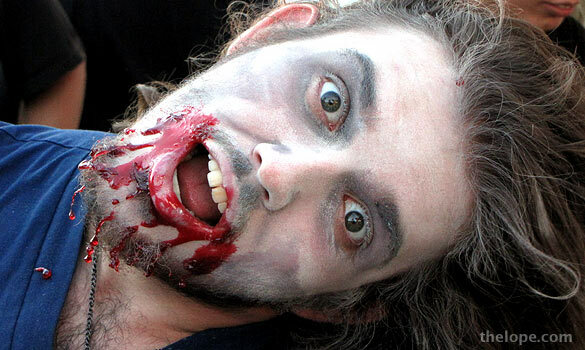 The CDC...Yes, the actual Center for Disease Control in Atlanta has a preparedness page for a zombie apocalypse. Really, see it, here. The idea is that if you're ready for a prolonged siege by zombies, you are, incidentally, ready for a lot of more common disasters. 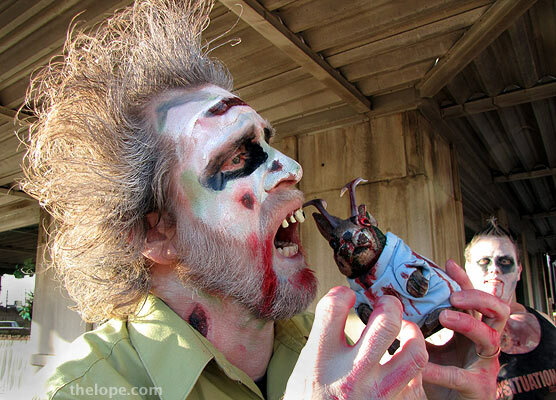 An already zombified Ace Jackalope is threatened by zombie Bob Colladay. 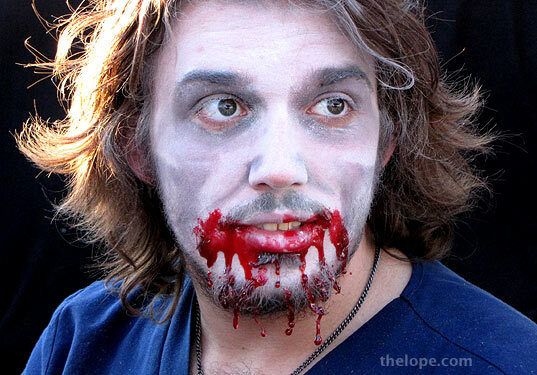 Usually zombies don't attack other zombies, much preferring fresh brains, but then, zombies are known for being somewhat confused at times. 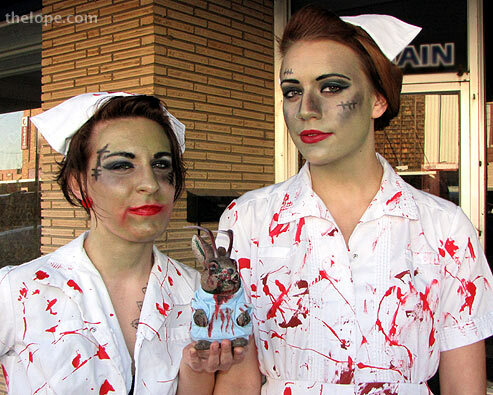 Fortunately there were hot zombie nurses on hand for any medical issues that might arise. Why don't nurses wear white uniforms anymore? I asked a nurse friend of mine that, and she laughed, remarking that several men she'd dated had asked her that. 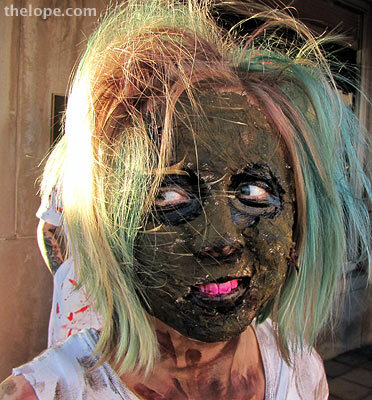 This wasn't the first time zombies invaded Hutchinson. 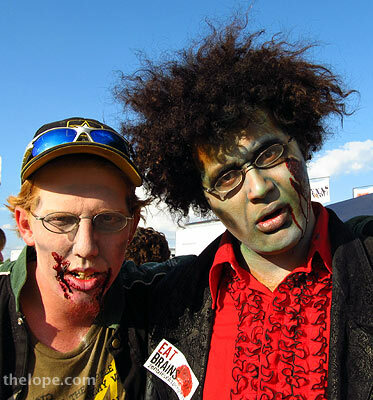 A group called Zombies Eat People set up a Zomb-A-Thon booth with the intent of having enough people made up as zombies in one place to set a Guinness record. That didn't quite work, but it did make for some nice random encounters with zombies. 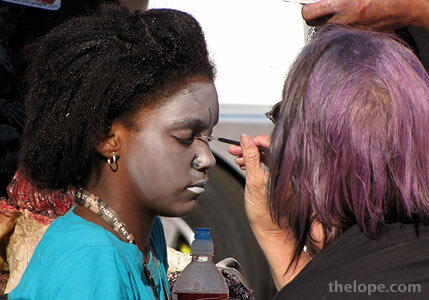 I spotted this zombie from the people mover. 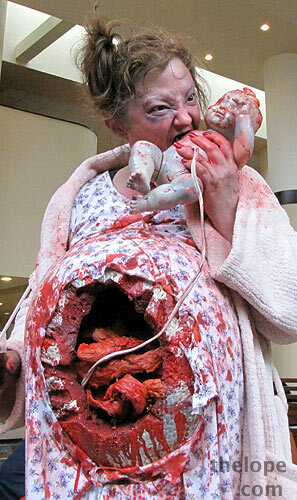 You know, if a cute girl wanted to eat my brain, I suppose I could live with that. With the organ gone, I could still do some things, like vote for a Tea Party candidate. 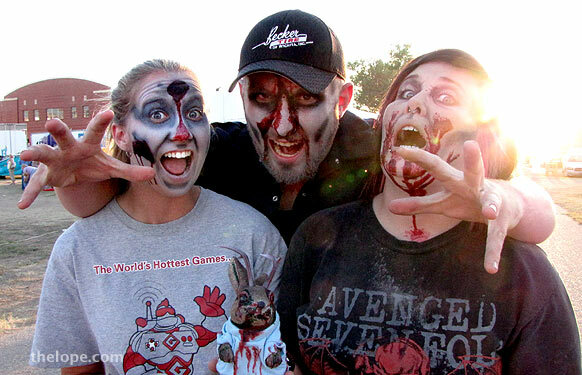 More Kansas State Fair Zombie pictures: 1, 2. 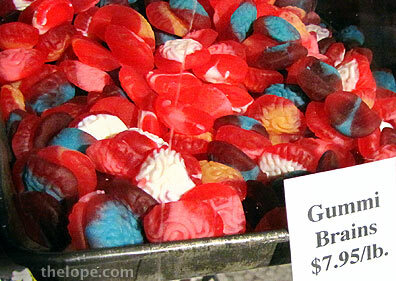 Maybe we could fool zombies with gummy brains like they sell at Lagomarcino's. 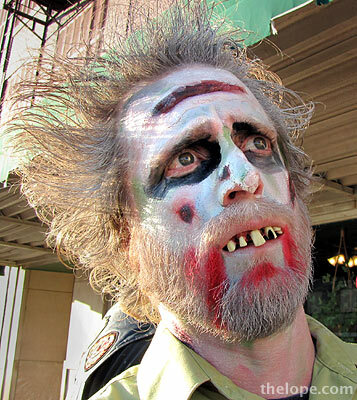 The most elaborate zombie I ever saw was at the "Texas Frightmare Weekend in 2009. 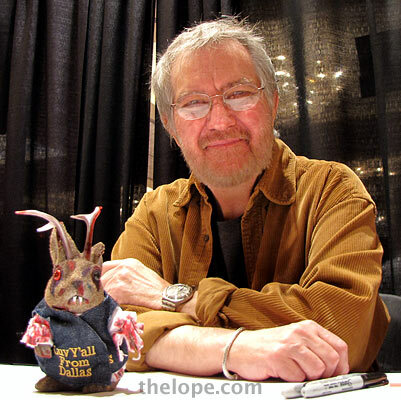 Also at that event was Tobe Hooper, director of the zombie-esque "Mortuary" and the better known "Poltergeist." Ace was suitably attired. 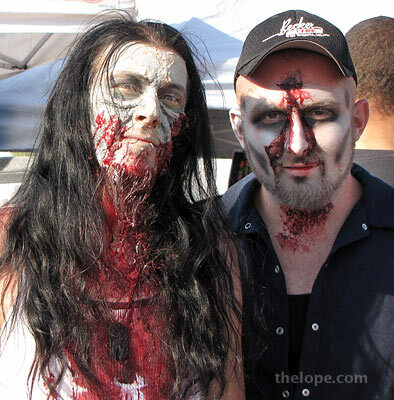 The Kansas State Fair undead guy on the left has a sort of Rob Zombie thing going for him. 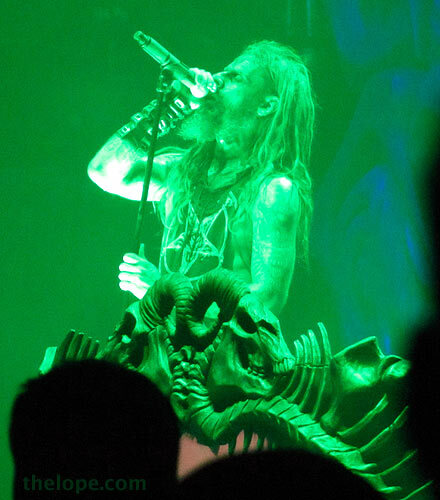 Speaking of which, the CDC offers no advice whatsoever on how to handle an invasion by Rob Zombie.